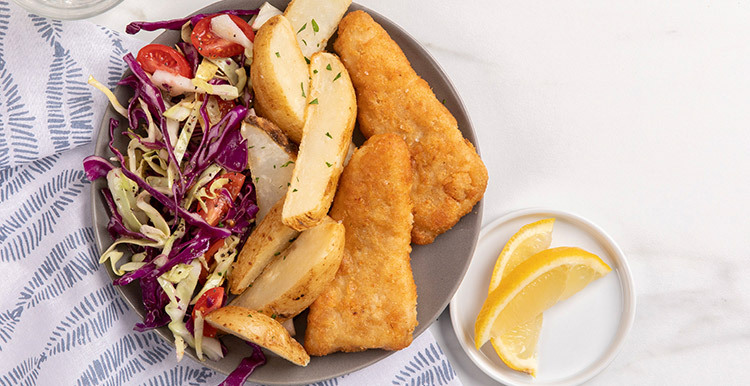 Feed your appetite with this British-inspired creation featuring battered Alaskan pollock and a plentiful portion of crispy potato wedges. CONTAINS: EGG, POLLOCK, SOY, WHEAT. Ingredients: COOKED ALASKA POLLOCK (ALASKA POLLOCK, WATER, WHOLE WHEAT FLOUR, VEGETABLE OIL [SOYBEAN AND/OR CANOLA], ENRICHED BLEACHED WHEAT FLOUR [FLOUR, NIACIN, REDUCED IRON, THIAMINE MONONITRATE, RIBOFLAVIN, FOLIC ACID], WHOLE YELLOW CORN FLOUR, CORN STARCH, MODIFIED CORN STARCH, WHEAT GLUTEN, LEAVENING [SODIUM ACID PYROPHOSPHATE, SODIUM BICARBONATE], PALM OIL SHORTENING, IODIZED SALT, EGG WHITE, SALT, DEFATTED SOY FLOUR), POTATOES (POTATOES, VEGETABLE OIL [SOYBEAN, CANOLA, CORN AND/OR SUNFLOWER], MODIFIED CORN STARCH, RICE FLOUR, DEXTRIN, SALT, LEAVENING [SODIUM ACID PYROPHOSPHATE, SODIUM BICARBONATE], CORN STARCH, XANTHAN GUM, BETA CAROTENE, DEXTROSE, TETRASODIUM PYROPHOSPHATE, AND DISODIUM DIHYDROGEN PYROPHOSPHATE [TO MAINTAIN NATURAL COLOR]). Nutrients: COOKED ALASKA POLLOCK (ALASKA POLLOCK, WATER, WHOLE WHEAT FLOUR, VEGETABLE OIL [SOYBEAN AND/OR CANOLA], ENRICHED BLEACHED WHEAT FLOUR [FLOUR, NIACIN, REDUCED IRON, THIAMINE MONONITRATE, RIBOFLAVIN, FOLIC ACID], WHOLE YELLOW CORN FLOUR, CORN STARCH, MODIFIED CORN STARCH, WHEAT GLUTEN, LEAVENING [SODIUM ACID PYROPHOSPHATE, SODIUM BICARBONATE], PALM OIL SHORTENING, IODIZED SALT, EGG WHITE, SALT, DEFATTED SOY FLOUR), POTATOES (POTATOES, VEGETABLE OIL [SOYBEAN, CANOLA, CORN AND/OR SUNFLOWER], MODIFIED CORN STARCH, RICE FLOUR, DEXTRIN, SALT, LEAVENING [SODIUM ACID PYROPHOSPHATE, SODIUM BICARBONATE], CORN STARCH, XANTHAN GUM, BETA CAROTENE, DEXTROSE, TETRASODIUM PYROPHOSPHATE, AND DISODIUM DIHYDROGEN PYROPHOSPHATE [TO MAINTAIN NATURAL COLOR]).